Well it was blood, sweat (nearly tears!) and plenty of aches and pains for everyone involved. Battling the course, which involves climbing 3 of Britain’s highest mountains, some of which in less than favorable weather (thank you Snowdon!) and travelling over 480 miles in 24 hrs. Tim Cockayne, Lisa Killinger, Eddie McFarland, Mick Carr, Chris Adams, Justin Brookman, Nick Brookman, Liam Wilson, Chris Griffin, Michael Dyson and Joe Flynn took part in the challenge to raise money for The Rainbow Trust…. And what a weekend it was!! It wasn’t easy and it wasn’t without incident but we can safely say that everyone put the effort in and pushed themselves to the max so far raising a staggering £6,500 for The Rainbow Trust. The Charity provides emotional and practical support to families who have a child with a life threatening or terminal illness. 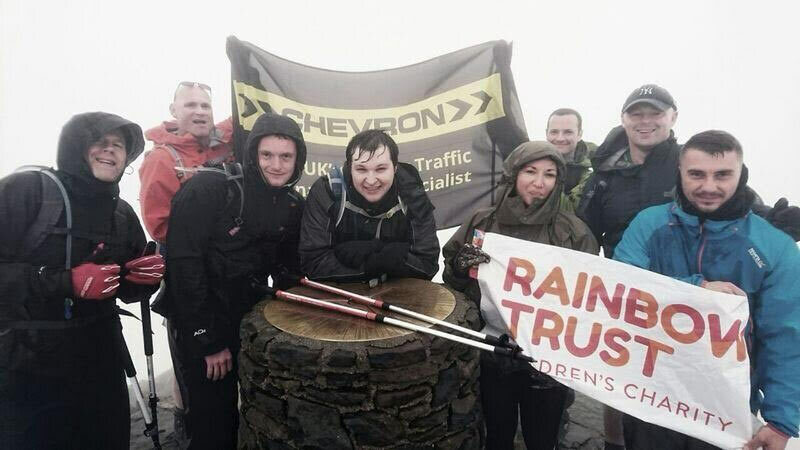 A very big thank you to everyone who has supported team Chevron.